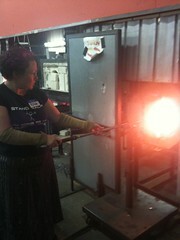 jojotbird took this awesome picture of me at the gloryhole yesterday during our six hour glassblowing workshop. Click through to see more. The theme was pumpkins, so we were making pumpkins and gourds, both solid and blown. I wasn't at all nervous going into the workshop, but as we walked through what we'd be doing, I got more and more nervous. That glass is hot! And, of course, I kept imagining how horribly wrong it could all go. After the first run through, though, it became clear that though things could go horribly wrong, the most likely versions of disaster would simply mean screwing up the piece I'm working on, and that's a kind of fuckup I can live with. Our instructor did a good job of letting us do enough that we really were making the objects, but stepping in enough to make sure that the objects were, you know, recognizable as what they were. Pretty great, really. I think I'm gonna go back. That all sounds marvelous! Did you keep the pieces you made? We do get to keep the pieces, but we didn't get to take them with us, because they had to sit in a hot hot oven and then cool very slowly. So I will pick them up after work some day this week. I'm so glad about the Dance Complex! Yay! Where did you go? I got to make a paperweight at a place in Newport, and I'd love to try doing more glasswork! Diablo Glass School in Boston. That looks like so much fun! I'm impressed! I'm also a bit jealous. If you go back there, I'm interested in joining you. If you post looking for company the next time, I may try to join you! when i went to the renaissance faire thingie this past summer, my absolute favorite thing was the glass-blowing demo--it did look like a lot of fun--it's great to hear that it really is! and perfect for a cool fall day--in the heat of july, those glass ovens looked a lot less enticing.